Why Choose ASW Home Builders? The ASW Homes brand is your assurance of quality construction, exceptional value and impeccable customer service throughout the home-buying process and beyond. We are driven entirely by the wants, needs and preferences of our customers — feedback is closely integrated into how we design our homes, what we put into them. To our way of thinking, it’s not about houses, it’s about people. We make sure we have superb local tradespeople to build our homes and we are continually looking at innovative designs and products to ensure our homes are modern, stylish and convenient so you’ll feel right at home. You take pride in your home and neighbourhood. We take pride in making sure you feel as happy 10 years from now as you did on the day you moved in. Everything we do is driven by what our customers tell us. It would be our pleasure to build a new home for you. 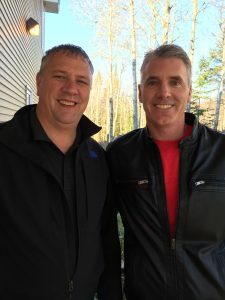 Adrian Saunders and Shawn Wheeler are the ideal business partners, offering over 40 years of combined experience in the construction and home building industry. They are involved with every aspect, starting with the land acquisition through to overseeing every detail during the construction process. This means bringing together a number of dedicated key people — architectural designers, estimating staff, highly skilled trades specialists, administrative personnel, and interior designers to name but a few. They each place a high value on personal growth and achievement in serving their purchasers and carrying out their corporate goals. Past experiences become lessons for the future and motivation for change and improvement. Their business philosophy is reflected in each project undertaken, and has earned them recognition and praise from homebuyers and industry professionals alike. Want to know more about what ASW Home Builders can do for you? Everything we do is driven by what our customers tell us. We understand what you are investing when you purchase a home, money of course, but also your hopes and dreams. We do everything possible to live up to your expectations, and make your new home construction an enjoyable experience. You take pride in your home and neighbourhood. We take pride in making sure you feel as happy 10 years from now as you did on the day you moved in. Our main goal is to make certain that ASW homeowners will consider us for their next home and confidently recommend us to their friends and neighbours for their new home construction projects. We are able to deliver quality, not just talk about it. We work side by side with trusted contractors ensuring that all aspects of your new custom-built home are completed to the highest standards and specifications. We want you to rest easy knowing you’ve purchased a home of exceptional workmanship from a company with unmatched integrity. Every ASW home is backed by an 8-Year Lux New Home Warranty Program – one of the best in the industry. Your ASW home is covered for any repairs outside of normal maintenance and for major structural defects during the warranty periods. We can offer these assurances because we use only quality materials and quality construction techniques and select only trade partners who share our philosophy of excellence. Thinking on building a new house or doing some remodelling? Get in touch and get a personalized quote!